I’ve already done a review on the best mattresses for back pain. Why would I do this one? Isn’t that the same? The answer is no. It isn’t. Back pain is too broad a term. It is used to describe all kinds of back pain, including lower back pain, but also any other, such as shoulder pain, neck pain, etc. If we’re talking about lower back pain specifically, lumbar area pain, then you need the best mattress for lower back pain. It’s that specific. There is a difference, believe me. For starters, upper and middle back pains usually originate from muscle strain. Sometimes, it’s there because of injury but more often than not it’s due to overstretched tendons and damage to ligaments. This can also happen to lower back, albeit less frequently. However, there is a cause of upper back pain that does not cause lower back pain. That would be postural stress. Postural stress might occur due to poor posture (naturally), too large a weight, and weak abdomen. Because of that, you may subconsciously bend your neck in order to compensate disrupted balance. And that would lead to constant muscle tightening. Not so with the lower back. Lower back pain can be caused by injury as well. Overstretching lower back muscles can also be the reason for it. However, posture barely affects lower back. What does (and, incidentally, might cause lower back pain) is lifting heavy things. That might put your very spine under stress. That meant, lower back pain might originate for spine rather than muscles. Upper back pain usually originates from muscles, especially neck muscles put under stress due to any postural issues. It’s not too hard to relieve back pain, at least temporary. Heat or, on the contrary, cold might help with that. Especially if we’re talking about sore muscles. In fact, mattresses aside, hot or cold compression pack might do the job. More so with acute back pain. Although you should be treading really carefully there. Back pain caused by muscle strain is hard to aggravate by improper treatment and even then consequences are generally not severe. But if we’re talking about back pain caused by spine issues (and lower back pain often is), there is a risk to cause some additional damage. It is not unusual for a doctor to not find any cause for the lower back pain. In that case, all there is left to do is lessening the pain and just dealing with it. For one, you need a mattress to help you with that. One peculiarity of lower back pain is that it is unlikely to be caused by the mattress itself unless you have it bad. The reason for that is purely… mathematical, I should say. If your mattress does cause back pain, it is not likely to be limited to the lower back. While there is not any statistics available on the subject, let us make some approximations. Let’s say, a mattress causes upper and middle back pain in 95% instances. That means, in 5% instances they would be causing lower back pain. However, many people suffer from lower back specifically. 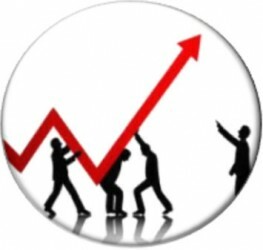 As a matter of fact, people are looking for means to relieve back pain in 60% instances, and in 30% instances, they are looking for back pain specifically. We have a mismatch. Therefore, you don’t have to worry about having a bad mattress. That’s good. However, this also means getting a merely good mattress might fail to help you. You need a very specific set of mattress qualities to help you with the cause of your lower back pain unique to you. What should a mattress help with lower back pain be? First of all, to relieve the lower back pain you might need to strengthen your back. A soft mattress might make the matters worse rather than help. Not necessarily so, mind you, but the very possibility is there to take into account. And let us not forget lower back pain might radiate into your legs, so you need a comfortable surface for them as well. Latex mattresses are the best option for lower back pain. They provide supple support, just the thing for it. However, sometimes memory foam mattresses would work too, firstly, due to their ability to conform to one’s body outline, and, secondly, due to their ability to reflect the heat back at the sleeper. I’ve already said as much in my review on back pain in general, and now I’m just repeating myself. But this is important, so there. While mattresses might help you, you would do well to remember that if the pain is not caused or aggravated by a mattress it might not be whisked away by sleeping on another. That means, that in the case of lower back pain, a mattress alone might not be enough. You have to follow the instructions of your doctor as well. If you’re prescribed exercises, don’t forget about them. If you need to take some pills, take them. If you need to apply some gel (like analgesic), do that. However, a mattress will help you too. But, as I’ve already said, a mere good mattress will not be enough. You need something more than just support. Cushioning and warmth matter as well. The reasons for back pain may be very different. Sometimes, a good mattress would work if the reason for lower back pain was sagging. It’s still possible, even if improbable. You might only need a good mattress after all. If the lower back pain is caused by muscle strain, you would need a mattress to help you with that. Memory foam works fine in that instance. So do some of the best innerspring mattresses. You might actually prefer a soft mattress in that case. And if your lower back pain originates from the spine, you need to make sure your back is stretched. That’s in short. As a matter of fact, most of this review is dedicated to that kind of pain. To know that, you should contact a doctor, but if that’s impossible, make sure to remember when the pain emerged. Or, more importantly, what you were doing before it did. If you weren’t lifting something, the problem is not likely to be the spine. Still, consult a doctor to be certain. This is a hybrid mattress. Not once have I done a review on this mattress, and that’s including the reviews on mattresses for back pain. Well, naturally a mattress good for back pain would be good for lower back pain as well. But there’s a trick. With simple back pain, memory foam is the best solution. With lower back pain, latex is a bit better. 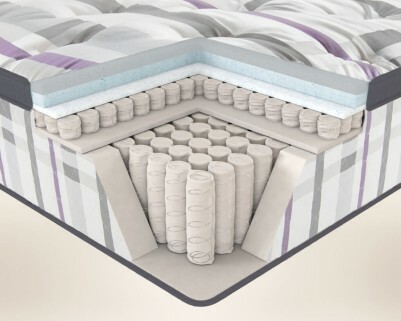 This is a hybrid mattress, however, and it combines two different technologies. The latex provides the support and memory foam the cushioning. The mattress, since the top layer is made of memory foam, is good for keeping your lower back (and tailbone in particular) warm. The foam will “melt” under your weight and temperature, conforming to your body’s outlines. 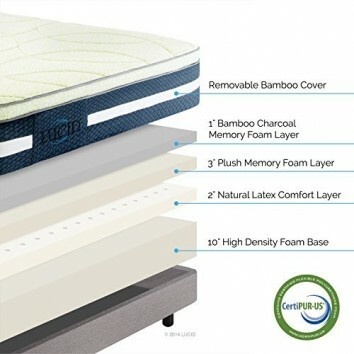 The top memory foam layer is infused with bamboo charcoal, and thanks to that any unpleasant odors you might otherwise experience are eliminated. The mattress is rather heavy. That’s not good if you have lower back pain, so make sure to get some help with setting it up when it’s shipped to you after you make your order on Amazon.com. Make sure you don’t use thick sheets with this mattress. Or a topper too thick. The reason for that particular advice is that the mattress’s top layers might fail to react to body heat if it’s separated from your skin too much. This primarily a latex mattress. 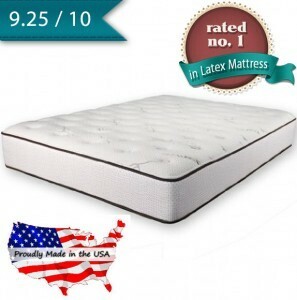 Just like any other latex mattress with the latex layer on top, it’s anti-allergenic, anti-microbial and mold-proof. But what matters to us is how suitable for lower back pain sufferers this mattress is. Thankfully, it is very suitable for lower back pain. This is latex, and it provides comfortable supple support, just right for sore lower back pain. If you need a mattress to stretch your back, this is your first choice. Sometimes, cushioning matters a lot for a bad lower back. If this is important to you, you would be happy to find out it comes in 4 comfort levels: Firm, Cushion Firm, Plush/Medium, and Ultra Plush/Soft. Plus an extra “comfort level” on Amazon.com. It’s not exactly a comfort level, it’s the possibility to get help from an expert on choosing one. Use this option if you don’t know what firmness level you actually need. In fact, you can do so right now if you follow this link to the item on Amazon.com. For lower back pain I would suggest the Firm comfort level unless you’re a side sleeper. In that case, I recommend the cushion comfort level. The overall height of the mattress is 10 inches, with three inches, taken by latex. The rest is basic high-density foam. It provides perfect support for your back. Now, I gave this mattress the first place when I was reviewing mattresses for back pain. So why the sudden downgrade? The answer should be obvious if you give it a thought. I have said latex mattresses are better for lower back pain rather than general back pain, have I not? And that’s what all of this is about. This is a memory foam mattress, and because of that it’s more suitable for upper and middle back pain, less so for lower back pain. There are only two sizes available: Queen and California King, but the manufacturer promises to rectify that sometime later. The mattress has four layers, two of them infused with air. 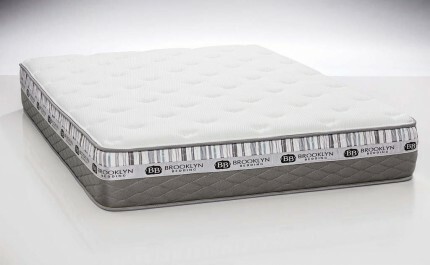 The first one is also made of high-density memory foam. It is an inch thick, while the second one is 1.5 inches thick. 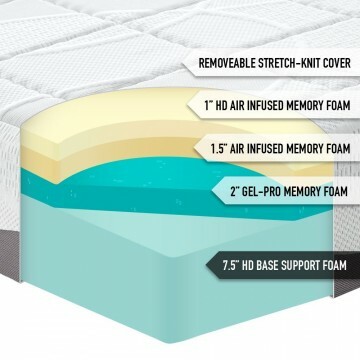 Unlike the other layer, it is made of low-density memory foam. It’s a bit firmer. The third layer is Gel-Pro Foam. Its purpose is to regulate your temperature during your sleep. And then there is the core support layer made of basic high-density foam. In combination, the four layer provide you with a perfect sleeping experience. Despite that, the mattress s still a bit firm, which is a good thing for a person who suffers from lower back pain. You can order this mattress on Amazon.com any moment. Also, I believe it wouldn’t hurt you to know that the mattress comes with a premium cover. Behold the King of mattresses for lower back pain! A very expensive king at that. Not that there is much that can be done about it. The only thing I can do is to not give it the first place. It is a very expensive mattress. The price for the King size mattress is several thousand dollars but you can save yet several thousand if you happen to purchase it on Amazon and be lucky enough to get a discount. Either way, the company even says those several thousand dollars is low price, due to their policy to keep expenses as low as possible. Truth to be told, it’s little wonder it’s that way since the mattress is handcrafted. But the mattress is worth it. It’s not a latex mattress, meaning, it’s wouldn’t be one of the best mattresses for lower back pain, but with its specific qualities included into consideration, it is. 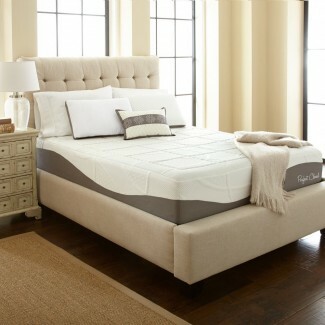 This is a hybrid mattress, memory foam and innerspring technology combined. 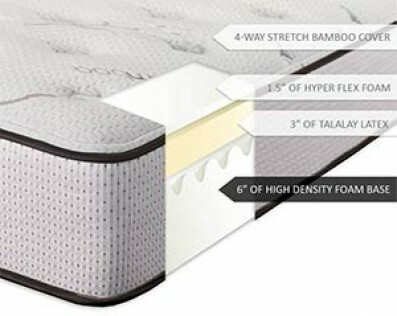 The memory foam conforms to your body, thus providing your back the support and warmth it needs, whereas the micro coils provide the general support and the firmness. Note that this mattress cannot be obtained in a physical store. It is only sold on the internet, must be cheaper that way for the company. And that means Amazon.com is one of few places where you can get the mattress. 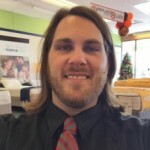 Follow this link and you will be able to buy this mattress on Amazon.com for yourself. This is the top mattress of today. Incidentally, it is also the top latex mattress. Of course, it’s not a coincidence. It’s only natural for the best latex mattress to be also the best mattress for lower back pain. I will never be too tired to repeat that latex mattresses are better suited for lower back issues, whereas memory foam mattresses are best suited for all other kinds of back problems. The mattress comes in three comfort levels, but I would recommend the firmest if you do suffer lower back pain. The overall height of the mattress is 10 inches. The basic core layer is 6 inches thick. Other than that, there also are two latex layer. The top layer is made of Talalay Latex, and the middle layer is made of Dunlop Latex. That’s not an often occurrence. Usually, only one kind of latex is used in a mattress. Talalay Latex is softer than Dunlop access. Here, it is used to provide cushioning, while the Dunlop Latex layer is used to provide additional support. Just like memory foam mattresses (although not to the same extent), the mattress retains some heat. While this would be a drawback usually, it’s a boon for a mattress for lower back pain sufferers. Besides, the heat retention is not too bad, it would cause no discomfort to those don’t tend to experience hot sleeping. 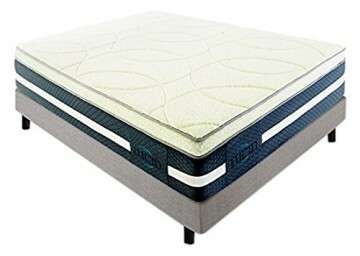 If this mattress is what you have been looking for, don’t hesitate and buy it on Amazon.com as soon as possible. 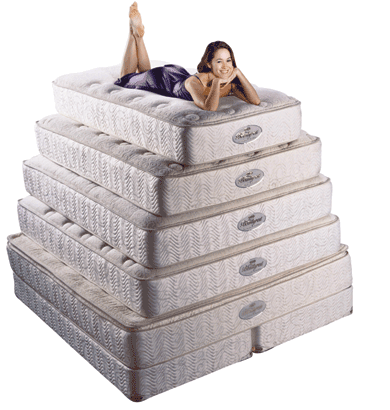 The best mattresses for lower back pain are usually latex mattresses. The reason for that is that they are usually firmer than most others types of mattresses, and even though some other mattresses are even firmer, they don’t have the give latex mattresses do possess. The main competitor to latex in this department is memory foam. It’s not soft per se, it’s firm and it conforms to one’s body easily, but that why this is not the ideal solution. Of course, it’s not the material itself that matters, it’s the firmness and the support it provides. Besides, depending on the nature of the back pain in your case, you might need a memory foam mattress. Or even a soft mattress. Lower back pain is a little bit more specific definition than simply back pain. Even then, it encompasses too many otherwise unrelated phenomena. The best you can do before you choose your mattress is to find out the nature of your pain.